You've probably seen enough green PS1 bags today to last you a lifetime, so how about some St. Paddy-approved furniture instead? 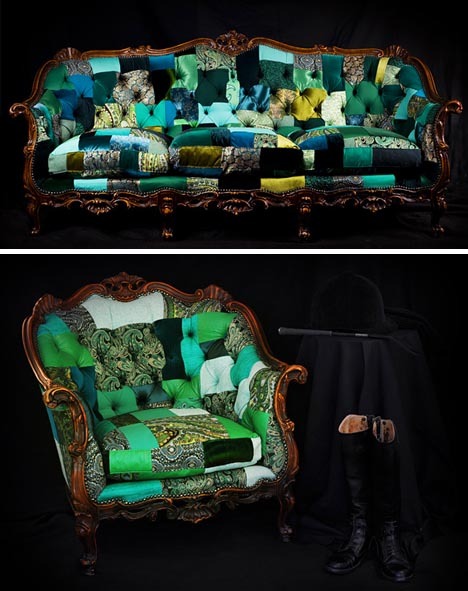 Design by LEFTOVERS takes ornate antiques and transforms them into playful contemporary pieces by reupholstering them with pre-loved garments. So, who knows? One of the patches on that armchair could be someone's old booze-soaked shamrock tee from last St. Patrick's Day. Though, I'd prefer to think that's not the case.